On the Second Thursday of the month, Sanford hosts Alive After 5 in beautiful, historic, downtown Sanford from 5-8 PM. Every second Thursday of the month, First Street is closed to traffic and lined with various vendors and food samples, as well as artists showing their wares, entertainment, and other fun events. However, the AA5 every January is special--it's time for the annual chili cook-off. Various purveyors, individual and restaurants hand out samples of their chili and the attendees vote for the best. This year, it was a popular vote that determined the winner. But no worry, I sampled about half or so of the 25 varieties there--there is only so much chili one can eat. Here's my rundown of what I had and what I thought was the best. In First Place: In my humble opinion, the top chili this year was from Shantell's Grill & Oyster Bar, the "3 Sons and 7 Daughters Chili" (yes, that's her family--it does make you wonder where she had time to learn such great cooking skills!). Why was it the top? Depth of flavor. Shantell's chili had a depth of flavor unlike any others there, I could tell there was layer upon layer. Yes, it was a bit hot, and I liked that. But just by the tiniest nose--and even though it had beans in it--I'd give it top billing. Shantell's restaurant is located just a block or two south of First Street on Sanford Avenue. It's well worth a visit, I just ate there last night! Second Place: And a very, very close second, was last year's winner, the chili from La Sirena Gorda Cabana (the "Fat Mermaid," as everyone know it), they had their "WhoopAss Chili." By far, this was the most authentic (Texan style) chili. Chuck was cut and slowly roasted, chorizo was also used, the flavor was rich and deep, and the addition of Mexican chocolate (the secret but necessary ingredient for a really rich chili) was use. I was hard put to pick a winner, as it was a very close race. This chili was also on top for me, outstanding. La Sirena Gorda is just off First Street on Palmetto. I ate there last week and was there last night for happy hour. It's really great food and a fun place. You should give it a try as well. Third Place: A close third was the chili from Hollerbach's Willow Tree Cafe, "Chicken Scratch Chili." It was unique and unusual in that it also included some root vegetables such as rutabaga, parsnip, and etc. Owner Theo Hollerbach is a constant and star supporter of downtown Sanford, the attend every Alive After 5 and hand out samples each time. I've never found anything they've fed me to be anything less than top notch. The restaurant is located right on First Street, you can't miss it, there's always a bit of a line, and for good reason. I ate there just before the holidays and it was good as always. And, by the way, you owe it to yourself to visit their nearby Magnolia Market, just off First Street on Magnolia Square. 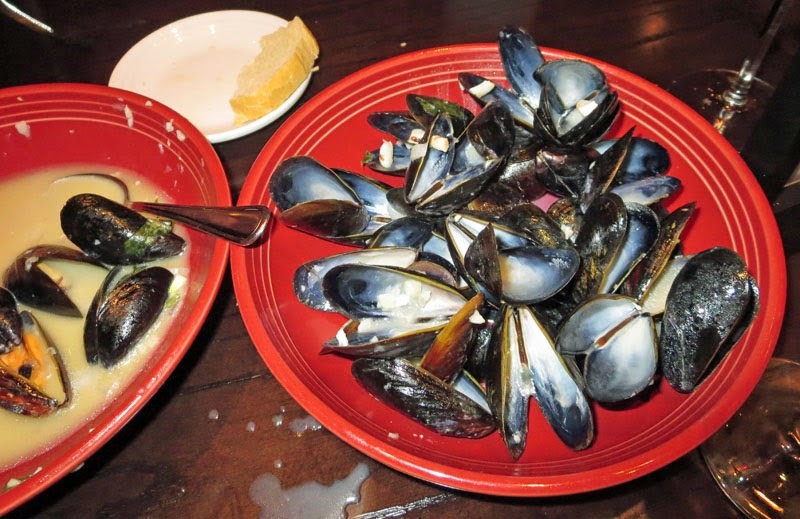 You can find lots of authentic German and central European food there. Give them both a try, the restaurant and market. Honorable mention #1: Dexter's from Lake Mary put on a very decent showing with their chili, it was very good, assembled and garnished right as you waited. It was also very good and was the people's choice, the winner of the chili cook-off. They, too, had a very Texas-style with the "Texas Smokehouse Beef Brisket Chili." Honorable Mention #2: Buck's Catering had a "Turkey Chili" that was surprising because it's use of poultry seasoning and sage reminded me of a turkey and dressing dinner. It was actually pretty good. Honorable Mention #3 was the chili from Gail Williams Insurance Agency, "White Chili." Her chili was second place in the voting overall. Her's was great in that you could tell that it was made with real, homemade chicken broth--it had that lip-smacking, mouth-feel that only gelatin can give. So it was also very good and I can see why it was so popular. Honorable Mention #4 has to go to Angel's Soul Food & BBQ, "Kickin' Lickin Chili." I would be remiss if I did not mention their chili. It was unusual and "outside the box." While a lot of the other chilis had beans in them, Angel's was unique because they used lentils! Yep, lentils. The chili was served over some rice and with a nice, crisp cracker that was extra-tasty. It really was a delight. Angel's is located just around the corner, a few steps south of First Street on Sanford Avenue. There is a reason they are so highly rated on urbanspoon.com--they do Soul Food and BBQ right. 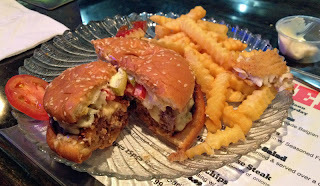 I've eaten there in the past and will again, and they, too are a great supporter of Sanford events, including AA5. You owe it to yourself to give them a try sometime. 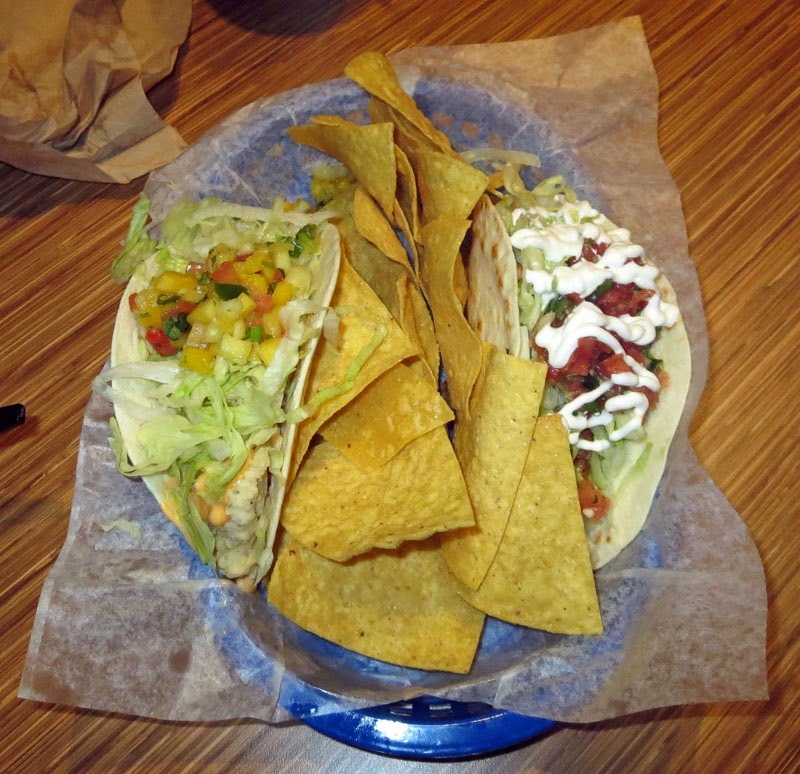 It may look like a dive inside, but the food is awesome! People's Choice Third Place was from Dreams & Destinations Travel, their "Chili Chili Bang Bang." I'm sorry to say I did not sample their chili, but apparently it was pretty good to come in third among 25 entries. Good job! Also rans and misses: There were a number of other chili offerings that I sampled as well, but those listed above were the best. Some of the others were OK. Some tasted like a can of tomatoes with ground beef. One of them had a burnt taste (you know who you are), and a few of them were cold. I was sorry that I could not sample all of them. I tried to hit the restaurants and local businesses first, and those who are frequent supporters of AA5 and other Sanford events. I congratulate all who turned out on a somewhat dreary evening to provide a lot of fun and good eats to all who were. there. It was another awesome time. A lot of people put a lot of hard work into their chili. Some spent days on it, and you could taste that depth of flavor. Some were more afterthoughts, but still, it's good that the spent the time (and their own $$) to support Sanford and this great, fun event. Kudos to all the participants for being there. If you'd like to know more about Alive After 5, I suggest you find them and friend them on Facebook: https://www.facebook.com/AliveAfter5. 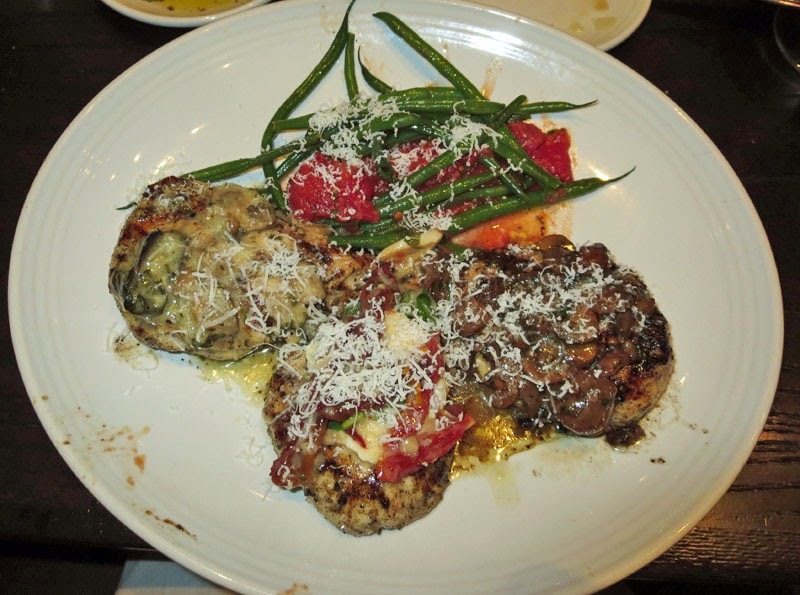 A new Carrabba's Italian Grill opened recently in Sanford, near the Seminole Towne Center Mall. We first went there on opening night, because they were donating a portion of their proceeds to the Wayne Densch Performing Arts Center. That was a busy night but we were lucky to snag one of a very few chairs that are right by the kitchen, and we were well entertained (plus had delicious food). We did have a small "hiccup" where our waitress said, "hey, it's still happy hour" but when she brought our drinks said "so sorry, we missed it by just a minute." Well, a manager later and we were square away and so was the waitress--heck it was a learning lesson for her as well. And the food and service were awesome. Our next visit, and the subject of this blog post, was for my friend Tommy's birthday. We had an excellent experience and meal. We started out with our waiter telling us, "hey you just missed happy hour but i can squeeze you in!" And he did. Now that's what I call great service. I'd like to think our opening night experience helped train their staff a bit. We started off with some wine and had a coupon for a free appetizer, so we tried the Mussels. All I can say is wow. They were wonderful, very buttery with a hint of the tartness of a good white wine and garlic. There had to be a good two dozen of them and we devoured them. As you can see from the picture, we were mostly through them before I was even able to take a picture. Wonderful! 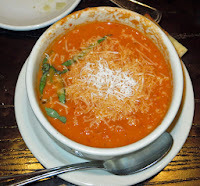 We both decided to start our meals with a cup of their Tomato Basil Soup. It was a good choice. The soup was wonderful. It had the great flavor of roasted tomatoes complimented by a bit of tang from some red wine vinegar, and then a bit of sharpness of parmigiano-reggiano. It was truly outstanding. The finish with the cheese and fresh basil julienne gave it a wonderful aroma. It looked great, smelled great, and, most of all, tasted great! For his main course, Tommy ordered a steak, the Filet Fiorentina. 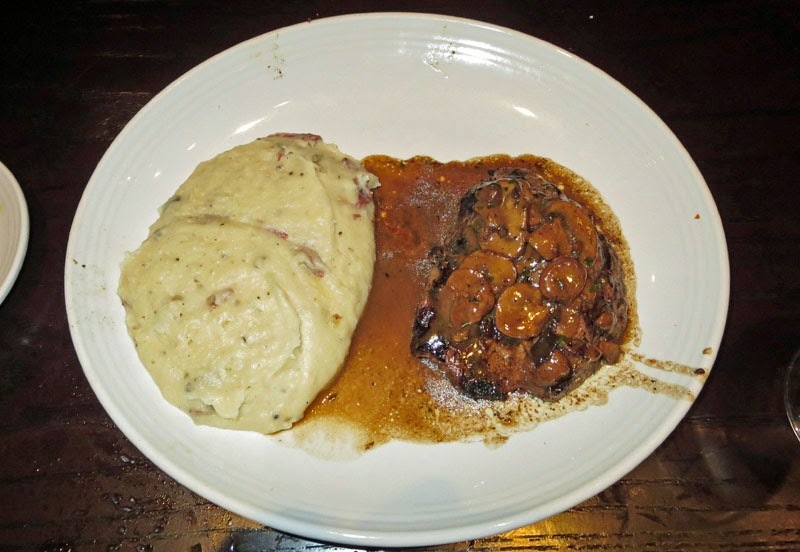 It was a nice tenderloin steak cooked on the wood grill, covered with a wonderful mushroom gravy, and accompanied by garlic roasted mashed potatoes. First of all the potatoes were excellent. Little lumps and some red skins all made it very rustic, and the taste was wonderful, smooth, and creamy. The steak was also very good, perfectly cooked, and had a nice aroma from the wood fire. For my main course, since I could not make up my mind, I had the Chicken Trio. This was a great combination, smaller portions of three different dishes, the Chicken Bryan, Chicken Marsala, and Chicken Rosa Maria. All somewhat different, yet each absolutely delicious. Mine was accompanied by some fresh green beans which were lightly sauteed but still a bit crisp--just the way I like them. 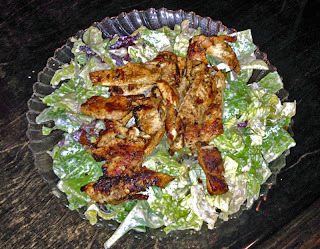 Each of the Chicken dishes was wonderful in its own regard and I'd be hard-pressed to chose a favorite. I guess that's the reason for the trio, you don't have to choose. Throughout our dining experience, our waiter was very attentive. The food was excellent. We are both fans of Carabbas and will be back, for sure. I suggest you give them a try as well. We were at a recent First Wednesday Wine-Art event in downtown Lake Mary. One of the food trucks there was K Burgers Food Truck and so i decided to give them a try. They sure make a decent, delicious sandwich. I had the Black Russian Special. It was thinly sliced pastrami served on black russian rye bread. 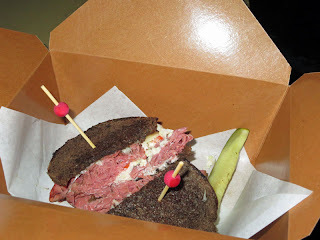 The pastrami was piled high, topped with a chipotle slaw and swiss cheese, and then grilled to perfection. It was served with some homemade pickles on the side. And "how was it" you may ask? It was absolutely delicious. The presentation (inside a waxed carry-out box) was pretty good as well. The black russian rye was hearty and delicious, all that a good black russian rye should be. The pastrami was excellent, and the crunch of the coleslaw added great texture, along with the creaminess of the swiss cheese. Would I order it again? Yes, in a heartbeat! We heard that there was a new restaurant that had just opened in Lake Mary, a chain, and so we decided to give Jimmy Hula's a try shortly before Christmas. I am always a bit wary of visiting a new place until they've had some "burn in" time, time to get things in order and smoothed out. This visit proved me right. The actual food itself was quite good, only the timing suffered a bit. Let me explain. We walked in and were a bit confused about what to do, but the person at the counter was helpful and we soon had a menu in hand. You order at the counter, then you get a number and they bring the food out to you. We placed our order and took a seat. It's a nice place and newly remodelled. Originally the site of our then-favorite Italian Restaurant, that had changed hands and went downhill. So Jimmy Hula's took over the space and gave it an extensive remodel. It feels a bit "Jimmy Buffet" and bit "Key West." With garage doors that open it to the outside, i can imagine it'll be a great place to hang out when the weather improves a bit. Anyway, we placed our order and found a place to sit. It was not a long wait before my burger came out. 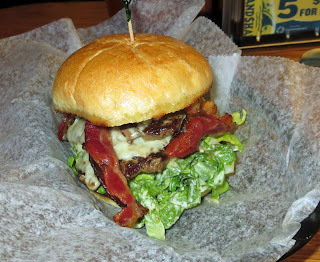 I ordered the Hulu's Burger, swiss cheese, bacon, BBQ sauce, and ceasar salad. It was quite good, actually. Yes, a bit on the messy side, but a decent burger. They did not ask me how i wanted it cooked and it came out medium well. I'd prefer closer to medium or medium rare, but it was decent. Well, now I had my burger, but my friend Tommy did not yet have his food. In a few minutes (maybe one or two) when someone came to check on us, we asked about it, they said they'd check. In another minute or two, someone else asked how it was and we again asked about Tommy's meal--they said they'd check. Now someone did come back and tell us they had a problem in the kitchen, then came back again and said they were remaking the order, and apologized for the wait. Eventually the food did arrive, along with their apologies. Though we were just happy to have the food, the waitress was insistent that they'd refund the cost of it. I was glad they offered but was willing to pay for what we got, but she was insistent, so they did take it off the bill plus made the tacos. 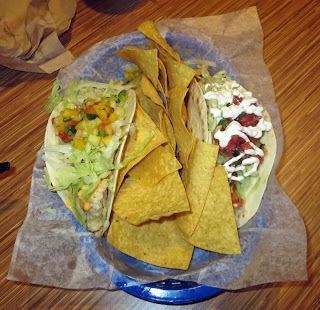 Now, a word about the food: Tommy had two fish tacos, each different, and each good. They were pretty decent fish tacos. The fish was fresh, the salsa (especially the mango salsa) very good, and all the ingredients fresh. They were good and I'd order them again, for sure. They were accompanied by some chips which seemed a bit out of place, but so it goes. Later on, as we were nearing the end of our meal, a manager came out and brought us a complimentary dessert and again apologize for the mix up and delay with our order. I was quite pleased with the customer service. Yes, it's a new place and you can expect some issues while they work out the kinks. I thought the food was good and decent and that they really outdid themselves in trying to make their mistake right. I will return, I'm sure. It looks like a fun place and a nice addition to the Lake Mary food scene. Shantell's Cafe & Oyster Bar, for a while now. I first met her and her delicious food at Sanford's Alive After 5, where she'd often set up, hand out samples, and promote her catering business. Later we got to know her and Eric as the did karaoke at La Sirena Gorda Cantina, a favorite hangout of ours. And eventually, she took over that restaurant on Mondays, providing a buffet of great caribbean food. So it was with great joy that we heard she was opening a restaurant next to Fat Rats, a local watering hole. Since She's opened we've eaten there a few times. Above you can see a picture of the huge, 1 pound burger. Yes, it is huge. We've only had it once. Personally, I wish it was smaller, but then i can imagine that at two in the morning it looks awful good to someone who's been drinking all night. I was surprised by the first thing I ordered, the fish n chips, at left. 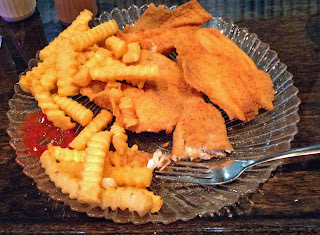 The cornmeal based breading on the tilapia was excellent, and they were cooked perfectly. 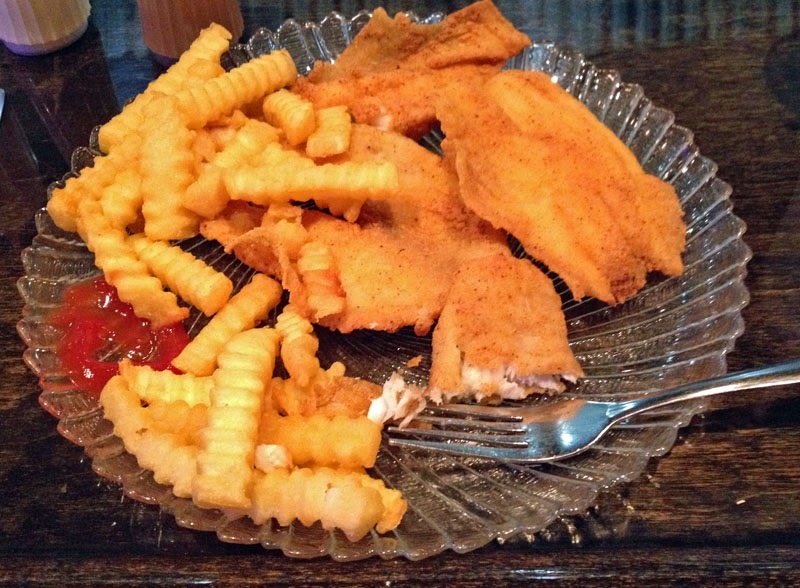 The only improvement I'd like to see is to use catfish, then this dish would be a home run. As it was, it was wonderful. 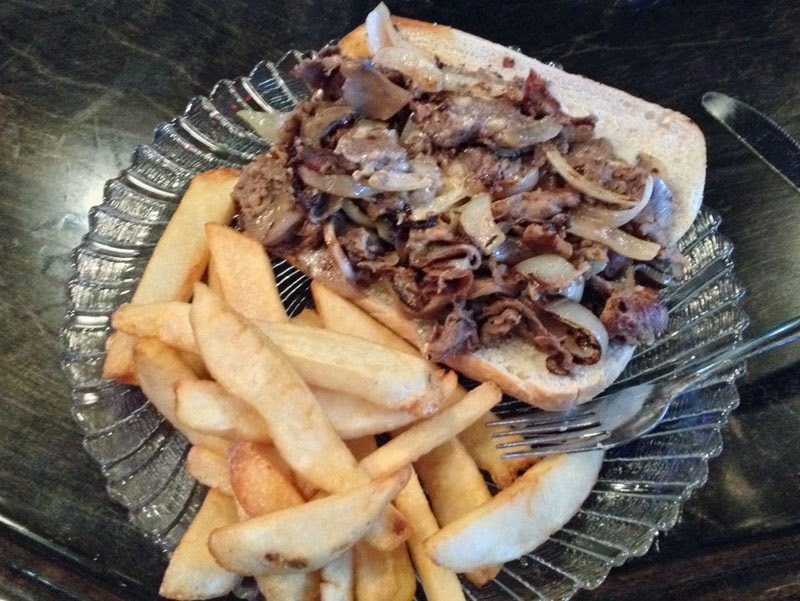 On another visit I had the Philly CheeseSteak (sans green peppers). I watched as Shantell herself prepared this and it was masterful. It was a very good cheesesteak and I'd order it again. The portion of fries, as with all the portions there, was more than generous. I could not eat them all, but managed to clean up every speck of the cheesesteak--it was that good. Tommy has enjoyed the Jerk Chicken Ceasar Salad on more than one visit there, and rightly so. The jerk chicken is to die for, and a hallmark of Shantell's caribbean cuisine--she sure knows now to cook. I've also had a bit of her stewed cabbage--OMG, it was wonderful, i did not know you could make cabbage taste like that--like "not cabbage." I've even learned a few tricks from here, like when to pick my collards. We've been to Shantell's a number of times now, and will certainly be back time and time again. The food is fantastic, the atmosphere wonderful, and all the employees are very helpful and pleasant. It's more like eating out with family than eating at a restaurant--that's how they treat you. We'll be back again and again until they get a restraining order!